When we come to the second book of Irenaeus, where he argues from tradition and the Gospel of John that Christ “did not then wont much of being fifty years old,” the modern reader generally has one of two base reactions. On the one hand, the reader that does not think much of the patristic writers generally will harbor a suspicion regarding Irenaeus that he is a man of small mind, much as Eusebius describes Papias owing to the latter’s chiliast opinion of a 1000-year paradise on earth (an opinion shared by Justin Martyr, Irenaeus, and Victorinus of Pettau). On the other, the one that exalts the Church Fathers will find a way to harmonize Irenaeus with the dominant post-Nicene church tradition and interpretation of the New Testament, whether that is by misunderstanding or marginalizing the author. One finds a hard time getting through the impasse created by the polemicist who giggles and the apologist who gags Irenaeus. Still it is the only genuine option open to us as critics that we steer clear of the gaping errors on both sides here and press on to reach an understanding of Irenaeus in his historical context. 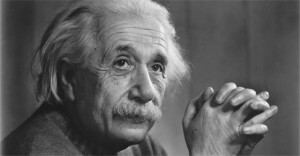 I’ve used the picture of Einstein simply because the photo is a modern representation of a mature, noble “master” of a man, the very kind of picture of Jesus that Irenaeus held. We can understand the argument of Irenaeus more clearly by looking at similar church tradition and by comparing it with knowledge about the stages of life current in the era. There is in Victorinus of Pettau’s On the Creation of the World an extended interpretation of the seven days of creation, which are the primary scriptural touchstone of the chiliastic view that the seventh day (most typically) represents a 1000-year kingdom established by Christ (using Psalms about a day being a thousand years, quoted by Victorinus). After comparing the seven days to seven aspects of the Word of God (Wisdom, Understanding, Counsel, Power, Knowledge, Piety, Fear of the Lord) and the nativity of the Lord (in a somewhat confusing passage owing to the sequence and number of comparisons), there follows this simple statement. Let us count Irenaeus here. First infants, children, boys, youth, and old men. Then omitting boys but only in the elucidation, while adding that old age allows perfection, followed by death. Here we have five ages followed by death itself, which is not necessary to the argument but is added anyway. Balancing death, which is not an age, with the nativity at the beginning, would give us the same seven as Victorinus: nativity, five ages of life, and death. as the elders who saw John, the disciple of the Lord, related that they had heard from him how the Lord used to teach in regard to these times, and say: … [quote follows] … And these things are borne witness to in writing by Papias, the hearer of John, and a companion of Polycarp, in his fourth book; for there were five books compiled by him. We may suppose that the original passage of Papias at a minimum contained the source behind Victorinus and Irenaeus for the nativity, five stages of life, and death of Christ. The text of Anastasius suggests that it contained other exegesis regarding the six days of creation besides this. We cannot deny the obvious sense of the passage, nor can we dismiss the statements of Irenaeus as an aberration arising from the heat of argument. We are left with determining the significance of such statements found in these second and third century authors, those of Papias, Irenaeus, and Victorinus. In fact, their particular significance in elaborating the stages in the life of a man is not due to any defect in the intelligence of the ecclesiastical writers but rather stands firmly in the same understanding of the world shared by their brightest Greek and Roman peers, men like the philosopher Aristotle, the physician Hippocrates, and the astronomer Ptolemy. In all these authors, the full age of a man is reckoned at 49 years, due to the numerological significance of seven sevens, a fact helpful to understanding Irenaeus when making the argument that his Master attained a perfect age and “did not then wont much of being fifty years old.” And here we can convict the error that assumes that Irenaeus says that Christ lived to be 50 or past 50. It is plausible that Irenaeus considered Christ to have been baptized at 30, to have begun his public ministry no later than age 46, and thus to have attained the perfect number of years at age 49. It is still quite possible, of course, that Irenaeus regarded the age of his Master at his death as being not exactly determined or being slightly greater or lesser. The same general point, however, is retained regarding the general age of life that one can be said to have attained all the attributes of humanity that are acquired from infancy to old age. A man who is not yet forty has accomplished the full development of his body but not of his mind. Further note the second century astronomer and astrologer, Claudius Ptolemy, Tetrabiblos, 4.10. [15th-22nd] “Venus, taking in charge the third age, that of youth, for the next eight years, corresponding in number to her own period, begins, as is natural, to inspire … the impetuous lover. Claudius Ptolemy can be seen as interpreting the Aristotelian tradition by placing manhood between the 42nd and 56th years, for fifteen years, as the middle year in this period is the 49th year that Aristotle defines as the prime of the mind. The middle year of young manhood is the 32nd year, which can be taken as an interpretation of Aristotle’s description of the prime of the body being from 30 to 35. Someone would have to be at minimum in his 42nd year to be a man (instead of a young man) according to the understanding of Claudius Ptolemy. The necessity of being in the fifth decade in order to attain to a mature age, the prime of the mind, is not lost on Irenaeus. The note above, incidentally, about the method of reckoning age inclusively, as can be determined from census records in Egypt, should help us understand Ptolemy the Gnostic. When he reads that Christ was baptized at 30 years old, he understands that Christ had completed 29 full years and entered his 30th year. Ptolemy then places 12 months before the crucifixion, which makes the lifespan of Christ exactly 30 years. The numbers 12 and 30 were interpreted astrologically as the number of months and lunar days, while the latter was decomposed into 8, 10, and 12 aeons (ogdoad, decad, and duodecad). Irenaeus was of sound mind when he wrote, in agreement with tradition and scripture. Instead of stifling his voice, it is necessary to elucidate the cultural context of the passage and witness that the five stages of life that he sees in Christ, culminating in an age of death near 50, is drawn straight from cultural assumptions about the stages of life and the prime of life that in his day would be commonplace, especially among those with an education in Greek. We need not suppose that his remarks are motivated by isolated, trifling musings gone wild or angry, exaggerated efforts to refute his opponents. Instead we should see the statements about his Lord living to more than forty years as being part of the theology of Irenaeus that is integral to his understanding of the incarnation itself. His own words about Christ going through all ages of life in order to save all men impress upon us that we do so. It makes you wonder if there is a foreshadowing of the year of Jubilee (49th year) if when Jesus declared that year of Jubilee, and pointing to other OT prophecies of grace and supplication upon the Messiah’s arrival, if Jesus was 49 when he was crucified. Certainly the Gospel of John’s indication from Jesus’ antagonists would certainly make more sense “you are not even 50 years old yet, and you say that you have seen Abraham.” I think we should be quick to doubt ourselves before doubting a student of a student of the apostle John, Irenaeus. the question is whether Irenaeus was citing the 50 year old Jesus as a historical fact, or as a theological construct. It’s pretty clear that he was citing it as a historical fact.